Earth has cooled dramatically over the last 50 million years. Ice sheets, flora, and fauna all record those changes. About 55 million years ago, palm-like trees and crocodile-like reptiles lived north of the Arctic Circle and beech trees grew in Antarctica. By 35 million years ago, glacier ice was starting to spread in Antarctica. Today, the continent is more than 90 percent ice-covered. The first major glaciations in Greenland began between 7 and 3 million years ago. The first continental ice sheets in the Northern Hemisphere appeared around 2.7 million years ago. The following discussion focuses on the Pleistocene, the most recent epoch of glacial and interglacial cycles of the Northern Hemisphere. About 18,000 years ago, when the most recent glacial age was near its peak, vast expanses of the northern continents were covered by glacial ice. In North America, two ice sheets covered most of Canada: the Laurentide Ice Sheet (LIS) in the east and midwest, and the Cordilleran Ice Sheet in the west. The LIS blanketed New England and formed great lobes that flowed down what are now the Great Lakes basins in the upper midwestern United States. Meltwater flowed from the margin of the ice sheet down the St. Lawrence and Mississippi Rivers. The ice carried sediments plucked from the ground beneath the ice. Most of that material, called glacial till, was deposited near the ice but some was carried by floating icebergs and by melt-water, to eventually be deposited on the ocean floor. Today, those sediments and many other geologic records are used to reconstruct past glacial cycles. Vast glacial ice sheets once covered large areas of the northern continents, ultimately shaping the land into its present-day forms. The smooth granite of Peggy's Cove, Nova Scotia bears witness to the scouring, smoothing, and polishing action of ancient glaciers. Geologists call the recent epoch of Northern Hemisphere glacial and interglacial cycles the Pleistocene. During the Pleistocene, about 2.75 million to 10,000 years ago, the great northern ice sheets grew and shrank about 50 times. The most recent of these cycles were first recognized in layers of sediments the ice sheets deposited on the land surface as they retreated. Four LIS cycles were identified in this way. The first evidence for older Pleistocene glacial cycles came from sediment samples brought up from the sea floor. * The sediments contain the shells of tiny ocean-dwelling organisms called foraminifera that sink to the sea floor when they die. The foraminifera shells record a key indicator for the ice sheets and their temperature cycles. Oxygen isotopic composition of the calcium carbonate shells can be related to the temperature of the sea water in which they grew, as discussed below. Isotopes are forms of the same element that have different numbers of neutrons and slightly different weights and chemical behaviors. In the case of water (H 2 O), hydrogen has two stable isotopes and oxygen has three. This is useful to paleoclimatologists because ocean water or ice is a mixture of water molecules with different combinations of light and heavy isotopes, and thus with different weights. Scientists study glaciers, ice sheets, ice shelves, and other ice masses to test theories about ancient climate and to develop hypotheses about future climate. Ocean circulation and plate tectonics are among the physical processes that play a key role in long-term climate change. 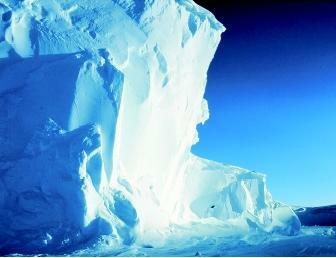 Shown here is part of the Ross Ice Shelf in Antarctica's Ross Sea. ocean, lighter isotopes are preferentially removed from the ocean. The process by which light and heavy isotopes are separated is called fractionation. When water vapor travels over the land surface, forms clouds, and precipitates as snow onto an ice sheet, the lighter oxygen isotopes are moved from the ocean into the ice sheet, leaving the ocean relatively enriched in the heavier isotopes. When the ice sheets shrink, the lighter water returns to the ocean. Foraminifera use calcium, carbon, and oxygen from the ocean water to build their shells; hence, as the oxygen isotopic ratios of the ocean water change, the ratios in the shells record those changes. When the sea-floor sediment cores are analyzed, large cycles in the ratio between heavy and light oxygen isotopes are found. 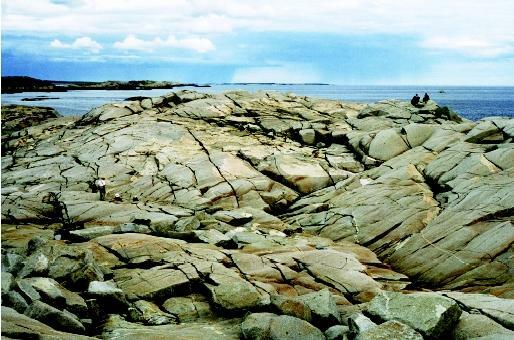 The oxygen isotopic record shows that over the last 0.9 million years, large ice sheets grew and decayed over approximately 100,000-year cycles. Before that time, there were two shorter cycles, one of about 41,000 years and one of 23,000 years. The oxygen isotopic record also shows that ice sheets grow slowly but shrink rapidly. Climatologists often classify the processes responsible for climate change as either forcings, which are large-scale processes that drive the climate system, or feedbacks, which are interactions among components of the system. The most important forcing during the Pleistocene is cyclic changes in Earth's orbit around the Sun. Orbital cycles are caused by the complicated gravitational interactions among the planets in our solar system. The result is predictable changes in the strength of the insolation (i.e., the solar energy arriving at Earth's surface). Earth's orbit changes slowly, and the insolation cycles are tens of thousands of years long, with periods that are very similar to the ice-sheet growth-and-decay cycles found in the oxygen isotopic record. In general, when summertime insolation is low in the northern hemisphere, ice sheets grow, and when it peaks, ice sheets retreat. The last northern summer insolation maximum was about 12,000 years ago, a time when the great northern ice sheets were shrinking. Earth today is experiencing an interglacial climate. In North America, the ice-sheet retreat began about 15,000 years ago and, except for Greenland, the great Northern Hemisphere ice sheets are now gone. Mountain glaciers are still retreating. However, if the current cycle is like the last three or four, the climate should be cooling and Earth should be entering a time of glacier regrowth. A short regrowth did happen, from about 1400 to 1900 C.E., a time called the Little Ice Age (LIA). The LIA had a profound impact on human welfare and culture. Climate cooling caused crops to fail and the resulting turmoil brought the end of feudal societies around the world. It is interesting to note that while Viking settlements in Greenland failed during the LIA, native communities adapted and survived. In the late 1800s, global climate warmed again, ending the LIA. The warming continues to this day. The end of the LIA might have been normal climate variability or it might be linked to industrialization, the use of fossil fuels, and the associated increase in atmospheric carbon dioxide (CO 2 ), a greenhouse gas . Why did the glacial cycle change 0.9 million years ago? Paleoclimatologists and glaciologists are still looking for the answer to that question, using a combination of fieldwork and computer simulations of the interaction between ice sheets and climate. Earth's climate had been gradually cooling for about the last 50 million years. One possibility is that once Earth's climate grew cool enough, the ice sheets could grow large enough to start forcing climate to change, instead of simply responding to it. Another idea is that, over time, the ice sheets modified the land surface enough to affect the way they moved, and thus the timescale over which they could grow and decay. Why did Earth start cooling 50 million years ago? Again, paleoclimatologists are not in agreement. Two possible answers lie in plate tectonics, which changes the arrangement of the continents and shapes of the oceans. Over the last 65 million years, Antarctica became an isolated continent over the South Pole, the Atlantic Ocean widened, and North and South America became connected. These changes isolated Antarctica, allowing it to become very cold. They also gave rise to the Atlantic Ocean's Gulf Stream, a current that very effectively moves warm tropical water north, where it cools and sinks, to return south again. Computer models show that the establishment of the Gulf Stream would have increased atmospheric moisture over Greenland and northern Europe, increasing snowfall and helping ice sheets to grow. Other theories have also been suggested, such as changes in cosmic ray intensity. Long-term cooling and warming likely results from a combination of several processes. SEE ALSO Climate and the Ocean ; Ice Cores and Ancient Climatic Conditions ; Glaciers and Ice Sheets ; Glaciers, Ice Sheets, AND Climate Change ; Global Warming and Glaciers ; Global Warming and the Ocean ; Isotopes: Applications in Natural Waters ; Ocean Currents ; Plate Tectonics . Pielou, E. C. After the Ice Age: The Return of Life to Glaciated North America. Chicago, IL: University of Chicago Press, 1991. Adams, Jonathan. North America During the Last 150,000 Years. Oak Ridge National Laboratory, Quaternary Environments Network. <http://www.esd.ornl.gov/projects/qen/nercNORTHAMERICA.html> . Climate can be modified on a variety of timescales. Ice cores from Greenland record millennial-scale oscillations in temperature that cannot be explained by Earth orbital cycles. Wally Broeker, a geochemist and paleoclimatologist at Columbia University suggested that changes in Atlantic Ocean circulation might explain the oscillations via a theoretical mechanism called the salt oscillator. The Atlantic Ocean's equator-to-pole circulation pattern depends on warm, salty water arriving in the north and cooling, so that it becomes more dense and sinks, to flow back south through the deep ocean. But if the salinity of the surface water were to decrease, the rate of sinking, and thus the ocean circulation, would slow down. That might happen if the southern edge of the Greenland ice sheet started to melt, sending fresh water to the ocean surface. When the circulation rate decreases, the northern Atlantic cools. That cooling would reduce the rate of melting, and thus the rate of fresh-water supply to the North Atlantic. Over time, the surface water would become saltier and denser, and the circulation rate would increase, bringing warmer water and warmer weather back to Greenland and Northern Europe. * See "Ocean-Floor Sediments" for a photograph of a sediment core sample.